End Trucks, Model EDL Low Headroom Under Running for Single Girder Cranes | EMH, Inc.
E-100.210.2000.1 4 in 6-6 0.33 hp 4800 lbs 12000 lbs Click for Prices. E-100.210.2300.1 4 in 7-6 0.33 hp 4800 lbs 12000 lbs Click for Prices. E-125.250.2300.1 5 in 7-6 0.75 hp 9800 lbs 23000 lbs Click for Prices. * Subject to minor variations. Standard wheels are for wide flange beams up to 13 inches in width. 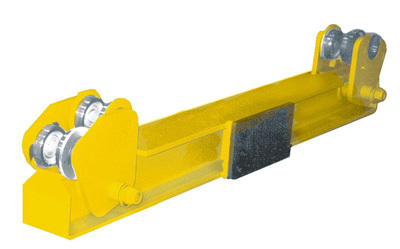 For larger flange widths, standard I-beams or patented track, consult EMH for additional cost and delivery. To view a pdf, click on the link, and the pdf will appear in a new browser window. (Please note, you must have Adobe Acrobat Reader installed to view these files.